June 2017 - Fret nut... Have Guitar! Have Guitar presents a small video on how to change your strings on a guitar with Gotoh Magnum locking tuners. This is the Gotoh Magnums without a “wheel” on the back of the tuners, not 100 % sure but I think these ones are from the SG-series. These Gotoh Magnum tuners works like this; inside the tuner peg you have a locking shaft and by fixating the top of the tuner peg that shaft will either loose or tighten as you twist the tuner – in other words either detatching or attaching the string. I think this will be more clear to you as you watch the video. I’ve tossed in a couple of others bits here as well, tips that might come in handy if you don’t know about them before. Hope you will have some use of this video! I do hope you liked the video and if you want to support Have Guitar! for it’s everlasting struggle against boredom – subscribe! Doesn’t cost ya a dime but every subscriber counts! Thanks for watching my videos and a very BIG thanks to all of you who already subscribes! Have Guitar is twice as happy as usual to be able to present to you – double feature Kemper Rig Showcase: Mattfigs Buddy and Camerica profile packs! The Buddy profile pack is based on the Salvation Mods MTS Preamp Buddy – inspired by the american amplifier Budda® Superdrive 60 “with a unique vintage/modern feeling and very expressive voicings” according to the information on their website. To me it sounds like a more vintage style amp and it has some really good tones in it. The Camerica profile back is based on Salvation Mods MTS preamp Camerica – inspired by the Cameron® Atomica amp (famous variation of Jose circuit), descibed as “High gain amp on HI mode, on LO mode hotrodded plexi with unique saturation”. This pack has some seriously good profiles and it sounds more “modern” than the Buddy. I hope you liked this double feature Rig Showcase – if so please do subscribe to support Have Guitar! It’s only a click for you but it gives great support for my channel! Thanks for watching and a special Big Thanks to all of you who already sub’s! Coming this Thursday … a new rig pack from a major profiler. Hmm, who could that be? Well, the amp is the Bogner Uberschall Twin Jet, I’ll give you that. And what’s that guitar? Have Guitar ostentatiously presents a new Kemper Rig Showcase – Live Ready Profiles Fried Chicken HBE profile pack! Now that name might give you a hint of what amplifier that has been profiled – it’s the Friedman BE-100 (brown eye!). (As said in the video) Live Ready Profiles is a relatively new profiler that according to me needs some attention, when I got this pack was pleasantly surprised by both variety and quality of the profiles. So, even if I recently did another Kemper Rig Showcase on Mattfigs BE100, I still felt this had to be done. On Friedmans webpage it’s described as “a hand-wired, 100-watt, EL34 powered, multi-channel British-style amp. By merely adjusting the gain and master volume controls, the BE100 can produce a variety of tones, seamlessly transitioning from blues to classic rock or hard rock to metal. To say it is British-styled is just the start of describing this inspiring tone machine”. It’s a tone beast and I think anyone would be happy to own this amp however we can’t all afford it… and that’s what makes the KPA so fantastic! I hope you digged this video – if so why not subscribe; you’ll get a notification every time there’s a new video out and you support Have Guitar. Thanks for watching and to all of you who comments, like and subscribes – thanks again, you’re the best! Looking for some uber Kemper profiles? Have a look at ReampZones new rig pack – Bogner Uberschall Twin Jet Kemper profiles. Soon featured on a Kemper Rig Showcase @ Have Guitar Youtube. Music tip of the week! The Lachy Doley Group! I just discovered this band today and they’re just great… well, maybe not if you’re a metal head or if you’re happy listenening to main stream radio crap – this is real music! Author adminPosted on June 18, 2017 Categories music tip of the week, Music VideosTags fret nut have guitar, music tip, the lachy doley groupLeave a comment on Music tip of the week! DiMarzio Norton vs Seymour Duncan JB – pickup shoot out! The DiMarzio is described as a pickup designed to “extend the tonal range and power without going over the top”. It has an Alnico 5 magnet and is rated by DiMarzio with treble 5.0, Mid 7.0 and bass 6.5. The Seymour Duncan JB is described as being able to handle any genre from blues to thrash with a hot output. It has an Alnico 5 magnet is rated as treble 7.5, mid 5-6 and bass 4-5 (roughly estimated by me as there are only staples at Seymour Duncans web page!). Hope you’ll like the video – if you do, please subscribe to support Have Guitar! Thanks for watching and thanks to all of you who already subscribe – you’re the best! The Fender SuperRev Clean profile can be found on Rig Exchange. Author adminPosted on June 15, 2017 Categories Reviews & TestsTags dimarzio norton, ESP Eclipse, ESP Phoenix II, fret nut have guitar, kemper profiling amp, mbritt, petes profiles, reampzone, seymour duncan jbLeave a comment on DiMarzio Norton vs Seymour Duncan JB – pickup shoot out! Have Guitar is luminously presenting a short review of this studio lights kit that just arrived! No more dark videos, no more looming shadows – all problems solved? Sure seems so! This is a ‘generic’ set of studio lights bought from a swedish webshop called “vidaXl” but I’m pretty sure you could get a kit like this from eBay or any other retailer – thus calling it generic. I think and hope this could be a guide for anyone looking for a solution like this… I’ve had a bunch of suggestions but all have been pretty expensive. Not saying those wouldn’t be worth it but I just didn’t feel flushing out more money on equipment right now. So the kit contains three LED-lights (5500 Kelvin, daylight level) together with stands, umbrellas and power supplys. With that you can easily set up a three point lighting for video recording or photography, reducing shadows etc. It’s no pro-equipment but it is working and it’s affordable. I’ve also thrown in a couple of tricks for video editing. I’m using Magix Movie Studio Platinum 14 but these tips should be usable in any video editing software. This is about adjusting the white balance and the color correction in the video to improve the output so I hope someone will have some use of this. I do hope you liked the video and if you wanna support Have Guitar! for it’s everlasting struggle against boredom – subscribe! Doesn’t cost ya a dime but every subscriber counts! Thanks for watching my videos and a very BIG thanks to all of you who already subscribes! Have Guitar is boldly revisiting the dragons den in this (bonus!) 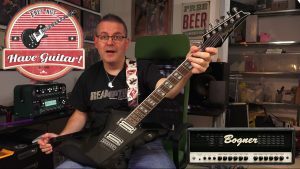 Kemper Rig Showcase – ReampZones Framus Dragon rig pack! ReampZone is about to update their Framous Dragon rig pack and Have Guitar! got a chance of testing out a preview pack of that update. It’s fat, it’s wicked and it screams… viciously. Very mean and very metal, if you ask me – or just have look at this Rig Showcase and judge for yourself. Just wanted to say; the video starts out a bit dark but it gets better. Had some problems with my low quality light setup but no more! I recieved my new lighting kit today and it works really well so that will most likely cure any problems like this in the future, it’s getting better.